“Everything you need to know about the Bible can be summed up by the great canon doctor Martyn Percy: ‘The Bible did not arrive by fax from heaven.’,” writes Dan Brown in his crypto-conspiratorial Da Vinci Code, making the Rev’d Canon Professor Martyn Percy the only living theologian to be so honoured (if it be). Unfortunately, the blueprint for the Church didn’t arrive by fax, either, hence nigh-on 2,000 years of ecclesial disputations and doctrinal divides about who has the administrative and spiritual authority to do what, when, how and why. The Very Rev’d Professor Martyn Percy isn’t particularly keen on the direction the Church of England is taking under the leadership of the Most Rev’d and Rt Hon Justin Welby: ‘Top cleric says Church of England risks becoming a “suburban sect”‘, blazes the Guardian, which is a fitting channel of peace, given that it is the favoured organ of ‘top clerics’ everywhere (except possibly Shrewsbury); and so the principal “suburban sect” to whom the message is proclaimed is the narrow one which prefers to pore over socialist rags in its quiet time, or meditate on the “theology of where I am coming from” rather than on matters of righteousness, holiness, morality and salvation. Professor Percy thinks the Church of England is being “driven by mission-minded middle managers”. Quite why ‘mission-minded’ is juxtaposed disdainfully with ‘middle managers’ isn’t entirely clear: is his problem with a church being mission-minded or with it being led by middle managers? Would it be acceptable to be mission-minded if it were driven by senior managers? Or is the objection to any kind of managers at all? Perhaps the complaint is aimed at the fact that Justin Welby is mission-minded. Can one be Christian without being mission-minded? Is it possible to be mission-minded without having a strategy to manage the mission? Where would we be without the form-filling and reflexive assessment? Or is it simply the manner of the Welby mission which Percy considers somewhat misshapen for the Established Church? Martyn Percy is obviously no prophet: he has far too much honour in his own college for that. But he is a visionary, if not a risk-taker. His beef is (very justifiably) with MBA-style management courses for bishops; the fast-tracking of a ‘talent pool‘; and an obsession with church plants (which are invariably urban and Evangelical-charismatic [ie HTB-inclined]). For the great canon doctor Martyn Percy, this whole mission strategy is profoundly awry: “It will take more to save the Church of England than a blend of the latest management theory, secular sorcery with statistics and evangelical up-speak,” he writes. “Secular sorcery” is harsh; very harsh. Justin Welby may be CEO of CofE plc, but he was never a student at Hogwarts; even less of the House of Slytherin. He has no particular expertise in charms, potions, magic or rune-reading. And as for ‘secular’.. well, Professor Percy manages Christ Church College, Oxford. Before that, he managed Ripon College Cuddesdon (or perhaps he left the managing to the Rev’d Professor Mark Chapman). Christ Church is a constituent college of Oxford University; Cuddesdon a theological college for the training of Anglican clergy. Is it possible to lead any organisation without ‘managing’ it, and, if not, why is it so objectionable to incorporate the best insights the world has to offer? Can nothing good come out of ‘secular’ theory? Is Weber so utterly crass and irredeemably superficial as to be devoid of application in the Body of Christ? Bishops are forced to operate like area managers, with targets set by headquarters rather than by spiritual pastors. He writes that the archbishop, a former oil industry executive, “has set about reforming and renewing the Church of England with a zeal and zest more usually associated with secular management consultants”. Former Archbishop of Canterbury Rowan Williams once observed of his successor: “Justin is, frankly, immeasurably better than I ever was at prioritising. He clearly knows where he wants to put his primary energies, and I was always much too ready to say Yes to this and Yes to that.” These are questions certainly of character and temperament, but they are also matters of business and assignment. Justin Welby is succeeding where Rowan Williams failed because his approach to doing mission chimes with the times, and, for all the theological cross-currents and intellectual tensions, those times are inclining more toward pragmatic evangelicalism than establishment liberalism. The Church of England was once referred to as being “crucified between two thieves” – a reference to the respective fanaticism and superstition of “the Puritans and the Papists”. There is a modern parallel with a church now suspended between the decline in institutional religion and the burgeoning of generalised spirituality; between the secularisation of society and the plurality of faith communities. The contemporary context is marked by diversity, fragmentation and all that is transitory; beliefs and practices are culturally relative, and Anglicanism has ceased to be supra-cultural or catholic. The Church has always struggled with the tension between the affirmation and assimilation of culture, and the call of the gospel to confront and transform it. American theologian H Richard Niebuhr outlined five possible relationships between the gospel and culture, which are the typical answers given in Christian history. There is Christ against culture; of culture; above culture; with culture in paradox; and Christ the transformer of culture. Each model of mission generates different understandings of the purpose and function of the Church. But each finds its expression in the ‘broad church’ via media that is the Church of England – which incorporates Protestants, Evangelicals, conservatives, liberals, Anglo-Catholics, and permutations of various fusions of these held ‘in tension’. Historically, some archbishops have viewed culture as antagonistic to the gospel, and adopted a confrontational approach. Others have seen culture as being essentially ‘on our side’, adopting the anthropological model of contextualisation, looking for ways in which God has revealed himself in culture and building on those. Those who adopt the ‘Christ of culture’ model have a syncretic approach and incline toward a mediating third way, keeping culture and faith in creative tension. This is Professor Percy’s approach to mission. Those who see Christ as the transformer of culture adopt a critical contextualisation which by no means rejects culture, but is prepared to be critical both of the context and of the way we ourselves perceive the gospel and its meaning. This is Archbishop Justin’s approach. He believes that culture itself needs to be addressed by the gospel, not simply the individuals within it, and truth is mediated through mutable cultural manifestations, which may present hurdles, but none is insurmountable. This model mitigates cultural arrogance or easy identification of the gospel with English culture. It also permits one to see how mission relates to every aspect of a culture in its political, economic and social dimensions, which is what occasionally brings Archbishop Justin of Canterbury into conflict with the Government. The task of the Church of England (and so the Archbishop of Canterbury) is to challenge the reigning plausibility structure by examining it in light of the revealed purposes of God contained in the biblical narrative. Justin Welby advocates a scepticism which enables one to take part in the political life of society without being deluded by its own beliefs about itself: Establishment commits the Church to full involvement in civil society and to making a contribution to the public discussion of issues that have moral or spiritual implications. But the difference is in character and temperament. On ‘zeitgeist’ matters of gender and sexuality, for example, both Percy and Welby are concerned with the pastoral dimensions of wholeness and healing. Both are persuaded that the mission of the Church accords with people’s quest for meaning and an assurance of identity which cannot be found without community, without fellowship. As the State Church it is uniquely called upon to minister to all: everyone is a parishioner. 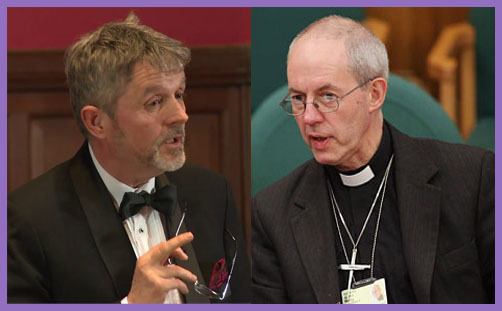 For Percy, such issues are fundamental to the Church of England’s mission of inclusion; for Welby, they are a distraction from the primary mission of changing hearts and saving souls. Notwithstanding some of the excellent work going on in some of the most impoverished parishes in the country, the public perception of the Church of England remains largely one of middle-class privilege and an élitism which has little relevance to a modern, pluralist, multi-ethnic, equal, just society. Therein lies the root cause of Percy’s “suburban sect”. While this is an undoubted misconception, it is exacerbated by the nature of establishment, the fusion of the Church with an increasingly secular government, and the liberal narrative propounded in the Guardian by so many “top clerics”. Whatever you may think, whether or not you agree with Martyn Percy, the Church of England has in Archbishop Justin Welby a man who is prepared to intervene forcefully and righteously for justice, peace, reconciliation and truth. But he knows the threshold of his influence, the essence of his own character and the limitations of his office. You may prefer and demand the perpetual missiological syncretism of ‘Christ of culture’; or the religio-political antagonism of ‘Christ with culture’; or the bold assertion of ‘Christ against culture’, but not all are called to your particular paradigm. Sometimes it is better to contextualise Christ; to be ‘with culture in paradox’, and then to live uncomfortably with the inherent and inescapable tensions caused by the inconveniences of human diversity and an awkward coalition of consciences. And sometimes it is better to chat over a cup of tea than slag off your brother as a secular sorcerer. Differences of understanding do not transcend the truth which makes us one in Christ: there is no fellowship to be found in hurling hyperbole to sell a book.